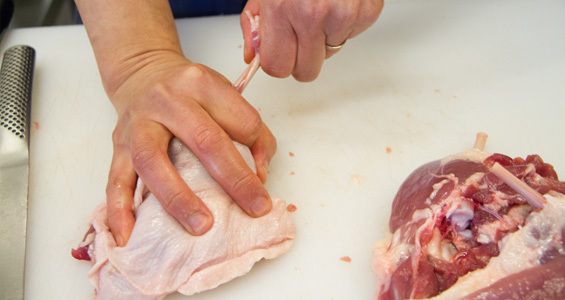 Frenching refers to cleaning protruding bones of meat and tissue before cooking for a cleaner presentation. Here we’re demonstrating with a duck leg, but the same technique is used for racks, “airline” poultry breasts, rabbit legs, some bone in steaks & chops, etc. 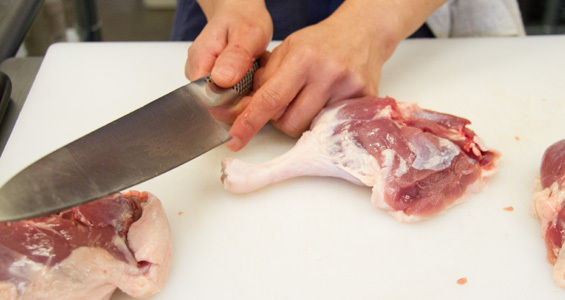 Use the heel of your knife to crack the knuckle off the exposed end of the leg bone with a sharp downward motion. Score the meat and skin at the opposite end (where it meets the main portion of the leg). Pull the meat & skin away from the bone (towards the cracked bone end) until the bone is clean. Scrape any clinging bits of meat off the bone with your knife if necessary.